According to Woman, Henna seems to be safe for most adults when used on the skin or hair. It can, however, cause some side effects such as inflammation of the skin (dermatitis) including redness, itching, burning, swelling, scaling, broken skin, blisters, and scarring of the skin. 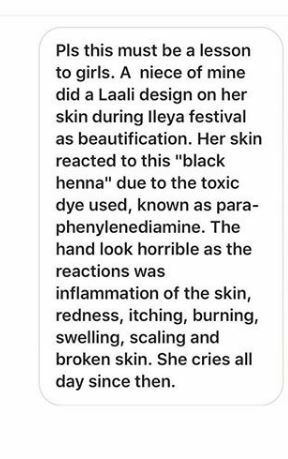 A lady has sent a Strong warning to Young girls out there, after her niece reacted badly to Henna, She got it on her hand during ileya Festival in Ondo State, And after sometime the thing turned into something else, Her hand started burning, itching, Swollen and more..
0 Response to "Lady Gets Henna On Her Hand, Few Weeks Later See What Has Happened To It (Photos)"